The final effects of intensifying trade wars are yet to be measurable, but other dynamic changes are causing the rental housing industry to face significant hurdles related to new apartment construction and renovations. A coincidental combination of natural, demand-related and political factors, as well as a very tight labor market, are increasing construction costs. According to the Bureau of Labor Statistics, the Producer Price Index (PPI) for all construction inputs rose from 102.1 to 109.7 from May 2017 to May 2018, a 7.4 percent increase. This is a dramatic reversal from the first eight months of 2016, when the same PPI experienced negative year-over-year growth. Among the different construction material PPIs, lumber and plywood saw the biggest year-over-year jump at 13.9 percent, followed closely by copper and brass mill shapes at 13.8 percent. Lumber was hit especially hard, as wood-boring beetle infestations and Canadian wildfires put a large dent in the supply. The Trump administration’s tariffs of 21 percent on Canadian lumber, a major source for the United States, along with Americans’ strong demand for newly-constructed homes, only sent prices higher. According to the National Association of Home Builders, these lumber issues added $3,000 to the price of an average rental housing unit and $9,000 to the average single-family home. 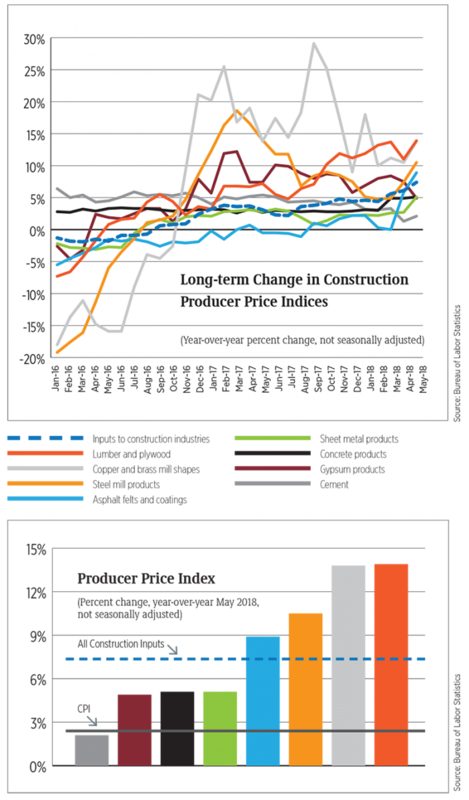 Just in the past year, the 7.4 percent increase in the PPI for all construction inputs greatly exceeded the 2.8 percent increase in the overall Consumer Price Index. Not a single individual input experienced negative year-over-year growth to May. Aside from lumber and plywood, and copper and brass mill shapes, steel mill products and asphalt felts and coatings also surpassed the year-over-year PPI increase for all construction inputs, at 10.5 percent and 8.9 percent, respectively. We have yet to see the impacts of recent developments in trade policy, which will doubtless lead to further fluctuations in prices. Canada’s new tariffs on U.S. exports, which took effect on July 1, were a response to the Trump administration’s steel tariffs. Prices for sheet metal products may see a bigger jump in the coming months. According to the Census Bureau, the total value of new U.S. residential construction put in place increased 6.4 percent year-over-year to May, compared to 4.5 percent for all types of construction. The increase for residential is lower than the 10.9 percent year-over-year increase in May 2017, but still higher than the 5.3 percent increase in May 2016. Put into a broader context for the past 10 years, the most recent increase in total value for residential construction is nothing out of the ordinary. Since this metric only measures projects completed thus far, the recent spike in costs for materials may not be yet be reflected. The final factor adding to construction woes for the industry is a historic labor shortage. Although the national unemployment rate ticked up to 4 percent as of June, it has remained stubbornly low, suggesting employers have had challenges with finding an adequate pool of workers. The rental housing industry has been experiencing a shortage of construction workers since the recession. At 34,600 employees as of May, rental housing construction employment only recently surpassed the previous peak in 2006. This does not consider, however, that there were 600,000 rental housing units under construction as of May, compared to just 416,000 units under construction during the last multifamily construction employment peak. Average hourly construction wages have reached their highest point ever, at $29.71, since the Bureau of Labor Statistics started keeping track in 2006. This translates into a 2.9 percent year-over-year increase from last year, higher than the 2.7 percent increase for all types of employment. The rental housing industry faces historic challenges against construction with growing costs and tight employment conditions. With natural factors like wildfires still affecting lumber, international trade skirmishes still escalating and an economy still revving, only time will tell if current conditions are temporary or part of a new normal.